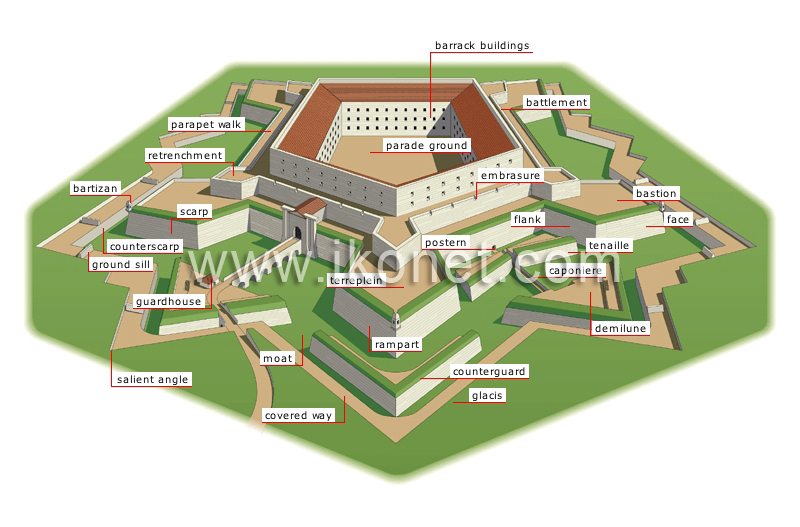 Star-shaped military fortification developed by the Frenchman Vauban in the 17th century. Buildings used as living and instructional quarters for the garrison. Wall allowing defenders of the fortification to fire from a protected position. Aperture in the battlement to allow for gun and cannon fire. A fortified projection consisting of two faces and two flanks, designed to reinforce a stronghold. Side of the bastion exposed to the enemy. Part of the bastion between the curtain wall and the face, making it possible to fire parallel to the face of the neighboring bastion. Fortification made up of two faces forming an angle opening inward, placed in front of the curtain wall and designed to shield it. Freestanding triangular fortification placed in front of a curtain wall and having a firing surface. Path dug through the moat to provide access to freestanding fortifications such as the demilune. Secret door built into a rampart. Horizontal surface of a bastion designed to accommodate the artillery. Freestanding fortification that protected the faces of the bastion and allowed the artillery to dominate the glacis. Sloping terrain surrounding a fortification to conceal the covered ways and the counterscarp. Walkway built along the counterscarp and protected by the height of the glacis. Thick wall forming the enclosure of the fortified place. Structure serving as living quarters for the guards. Projecting angle of the fortification, protecting the covered way. Fortification of earth or masonry perpendicular to the covered way and specially designed to protect the defenders against ricochets. Outer wall of a moat, opposite the fortified place. A sentry box projecting from a wall used to survey the surrounding area. Inner wall of a moat, closest to the fortified place. Raised fortification of a bastion allowing the artillery to dominate the terrain. Area serving for the assembly of troops. Passageway along a wall, making it possible to shoot and perform surveillance.